A bunkhouse travel trailer perfect for a family and friends get-away! Private Queen bedroom plus separate Double-Bed Bunks. 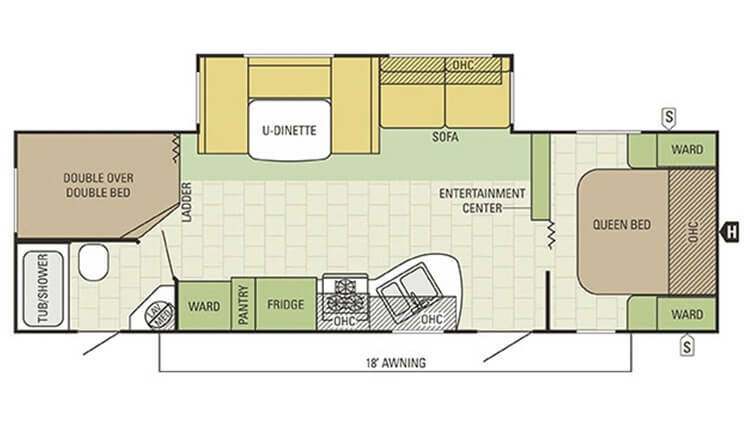 Living area slide-out creates a spacious trailer with room for all. Patio awning and plenty of outside storage. Cooktop (3 burners), Hood, Oven, Microwave, Refrigerator, Double Sink, Pantry. Dinette / Sofa Slideout, TV Cabinet, Overhead Storage. Private Queen Bedroom with night tables and storage. Bunkhouse area with double-sized bunks and privacy curtains. Tub/Shower, toilet, vanity with sink, plus exterior door. A/C, Window Blinds, Patio Awning, Outside Storage, Tank Covers, Rear Mounted Spare Tire.